Get 20% revenue share commission, no fees taken out of your commissions just one simple easy to follow commission. 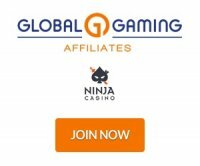 LuckyStar Casino Affiliates is the affiliate program for LuckyStar Online Casino. LuckyStar Online Casino offers a large selection of almost 400 games developed by leading quality providers. Licenced by the Government of Curacao they of a revenue share based on 20% gross loss. LuckyStar Casino Affiliate are happy to help you and provide any of the various marketing tools available. Banners, landing pages, text, all with your own tracking codes. Reports are available so you can see how your promotions are doing and adjust accordingly. Working with LuckyStar Casino Affiliates and promoting their casino is a great opportunity. LuckyStar Online Casino offers a huge number of games including table games, baccarat, blackjack, poker and roulette as well as slots featuring popular games such as NRVNA, When Pigs Fly and Charms & Clovers. With the number of games and mobile friendly the casino will be attracting players.